Every few hours a NOAA weather satellite passes over your head, continuously transmitting pictures in visible light, infrared, and shortwave infrared. Meteorologists utilize this information to predict weather. The good news is, so can you. With something like the NooElec SDR dongle, a computer, and a QHF antenna you can predict your own weather, even if all other forms of communication are not functioning. 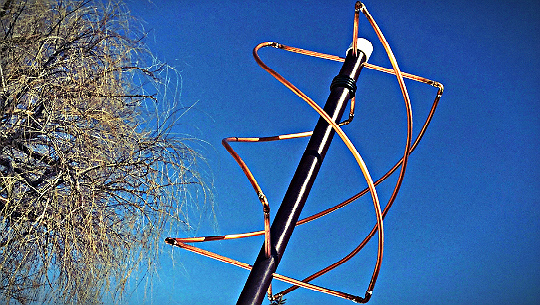 The “bad news” is, you have to build an antenna to receive the data. It’s not really bad news, but you will have to make an investment of both time and a little bit of money to start downloading your own images. Why do I need to build such a complex looking piece of machinery? That’s a good question; the answer is the Government doesn’t want you to have access to this data. No, seriously, it has to do with simple physics and the nature of radio. Here is a simple explanation- Antennas perform best when they are properly polarized, or the antennas are pointed in the same direction in three dimensional space. If you were to take two walkie talkies and point one antenna straight up and one sideways at a 90 degree angle you would notice that the reception would be severely degraded or nonexistent, even if in the same room. When you have a satellite orbiting the earth, even if the antenna is pointed straight down, its polarization to you on earth will change as it goes from horizon to horizon. 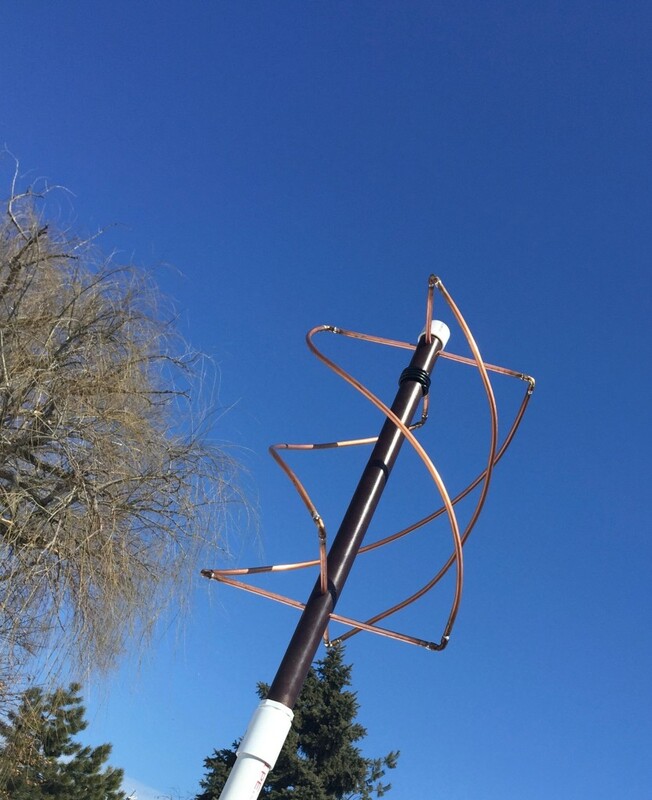 The solution is to build an antenna that is properly polarized in all directions, hence the QFH antenna. (1) Coil of 3/8″ OD Copper Tubing, 25ft. in length, like this one here. 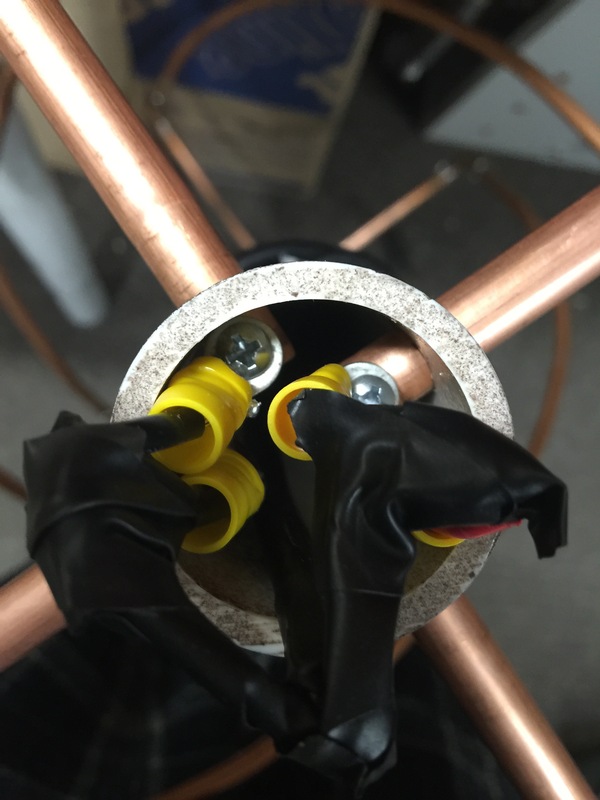 (8) 90 degree end fed 3/8″ Copper elbows. These were hard to find in the local HI store, Lowes had them, but you can get them online here. Make SURE they are for 3/8″ OD tubing..sometimes they are called 1/4″ elbows. (1) 10ft RG-58 Jumper – Its cheaper just to buy a jumper than a whole roll. You will be cutting off one end. (4) 18ga Ring Terminals– Size doesn’t really matter here. (1) Tube of outdoor clear silicon sealant. Please note you can click on all photos to be shown full size. 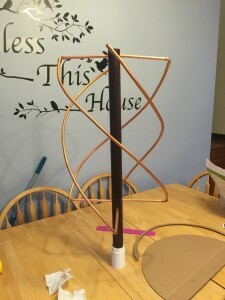 Remember, I built my antenna using this design and using this tutorial. It is a great design and reference, but it completely lacks a “how to” feel. I am NOT going to re-invent the wheel so please go to the page to see all of the finished drawings, specifically this one, this one, and this one. My intention is to tell you HOW I did it. 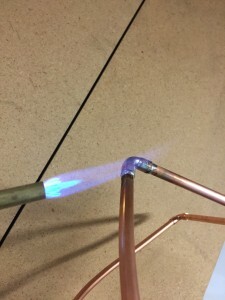 The very first thing you are going to have to do is prepare the PVC section of pipe. 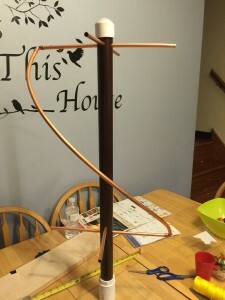 The actual antenna portion of the pipe is going to be 560mm (22″) tall, but you will need to put a cap on the top of the pipe and also have some tubing protruding below the antenna portion for mounting. I arbitrarily picked 3 feet for total size. For the top of the antenna you are going to have to drill (4) holes at right angles to one another. This will require you to make two templates, one for the top of the pipe and one for the bottom. Your templates should look something like this. I took a sheet of paper and cut out a 40mm wide strip. Draw a line down the middle of the paper. This will put your drill points 20mm from the top of the pipe. 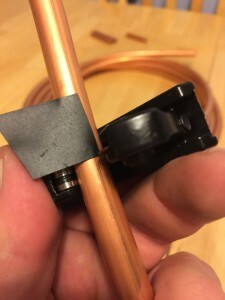 This is important because you will need room for the cap, but you DO NOT want to have to wire something way down inside the pipe. 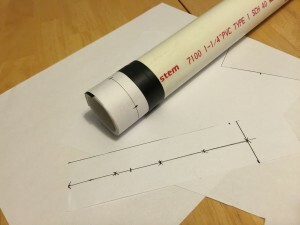 Take your 40mm wide paper strip and wrap around the pipe, marking the point where it overlaps. Take the paper off the pipe and measure the mark you made where it overlapped, this is the pipe’s circumference. Take that number and divide by 4. The point where the papers meet will be one mark, then take your measurement and mark the other three drill points. I am not providing these measurements as I do not know if all PVC OD is standard. Next you will do almost the same again, this time you will cut a 50mm wide strip of paper. 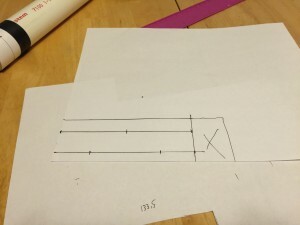 Make two parallel lines on the paper exactly 24mm apart. Take your measurement (Circumference divided by 4) and mark your drill points on the paper, this time staggering the points between the two lines. Next, you will have to tape these templates to the pipe where the holes must be drilled. This must be done as close to exact as possible and so the antenna elements are all 90 degrees apart from one another. To give you a picture of what the finished result should be, click here. 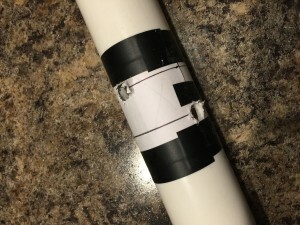 Using electrical tape, wrap the first piece of paper at the top of the pipe and secure it. Then take the second piece of paper and measure exactly 560mm from the top line to the bottom line of the second piece of paper. These holes must line up. I took a piece of straight 1″x4″ and used it to line up the markings for the holes. Once everything is lined up, use your 3/8″ drill bit and drill the holes. If you have a drill press..even better. Into a bunch of straight pieces. Here is what I did. 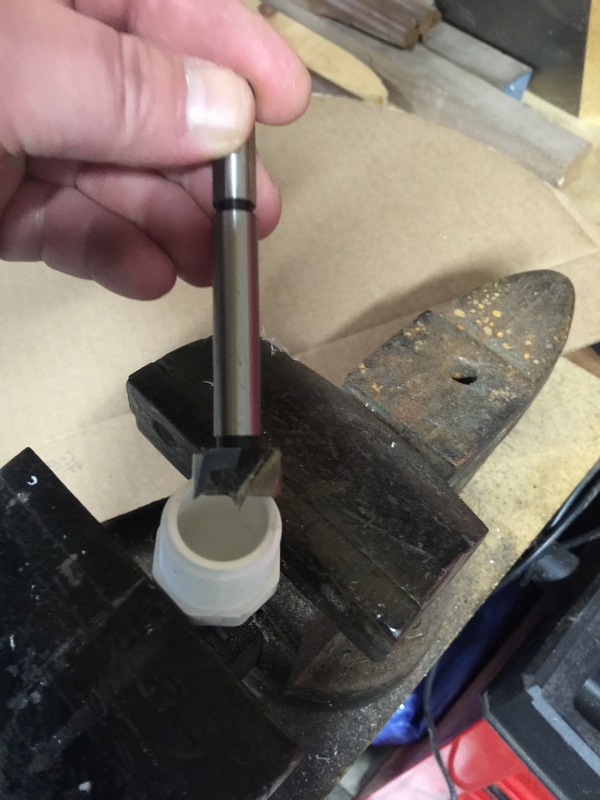 When working on the 812mm pieces, I would cut it maybe 10-20mm too long. I would carefully bend it as close as possible to the 1″x4″. Then I would roll it like dough until it was nearly perfect. 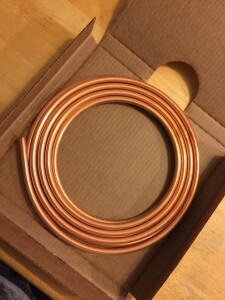 Some local home improvement stores will have short pieces of 3/8″ copper tubing. If they have it, spending a few extra bucks will save you a ton of time for all but the longest pieces. Once your pieces are straight you will need to cut them to the closest millimeter. One trick I came up with when cutting the pieces to length was to use a piece of electrical tape to mark the exact point that needed to be cut. Measure your piece and place a piece of tape right where your tubing cutter needs to go. Then loosely fit your tubing cutter over the tubing and slide it up until it hits the tape, tighten it down, and start cutting. Once you have all of your pieces straightened out and cut you will have to then re-bend the longer pieces into a half circle. 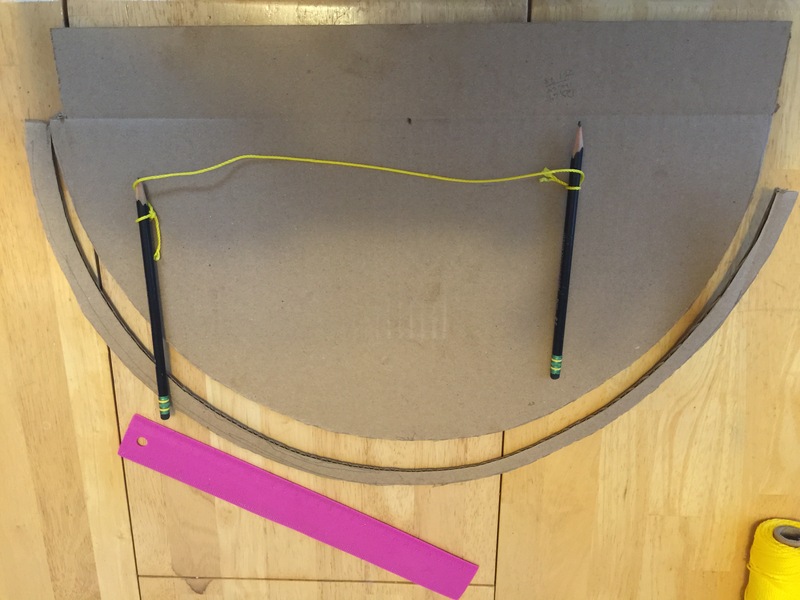 I took a piece of cardboard, string, and two pencils and made a rudimentary compass. 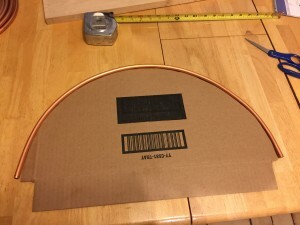 I first took the radius of the 812mm piece and scribed out a half circle on the cardboard. You can go the extra mile and do this in wood as well, but the cardboard worked just fine for me. Once I had the line scribed I cut out the cardboard. 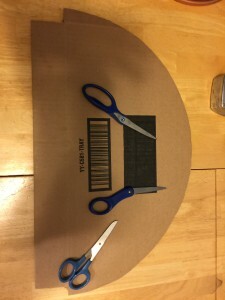 Make sure you use a sturdy pair of scissors. Then carefully bend the tubing around the cardboard template. When you have the 812mm pieces done, you can re-measure and cut for the 758mm pieces and repeat the process. Once all of your long pieces are shaped, you can begin assembling the antenna. At this point it begins to be putting pieces of the puzzle together with one exception. You must bend the long pieces on their perpendicular axis. This can be a bit tricky, so here is how I did it. 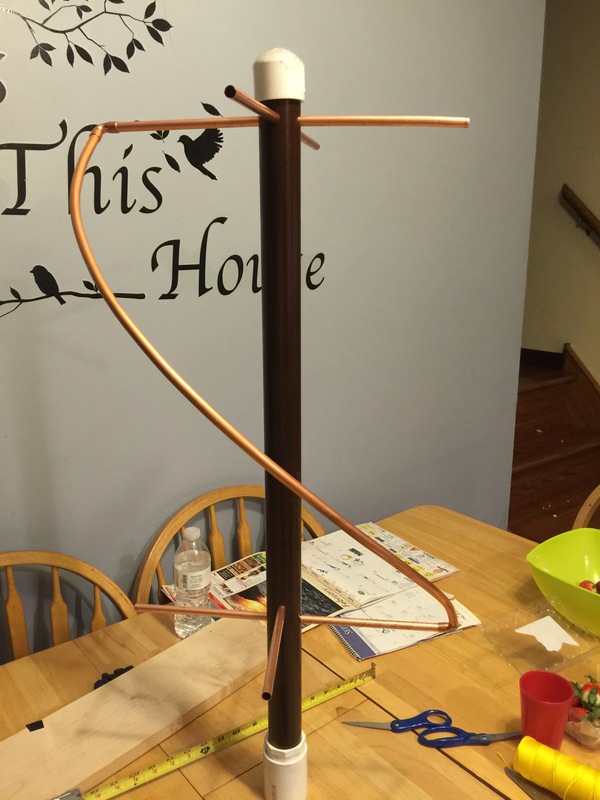 First, note that the top of the antenna receives the 178mm and 182mm straight pieces. Both 178mm pieces are opposite of one another and both 182mm pieces are opposite. At the bottom of the antenna, the lower holes get the 374mm piece and the holes that are 24mm above get the 356mm piece. The 182mm and 374mm pieces are parallel to one another. The 178mm and 356mm pieces are parallel to one another. Assemble them in their respective holes. Once the straight pieces are in, take an 812mm piece and lose fit a 90 degree elbow on each end. Attach one to the top cross bar like in the picture below. 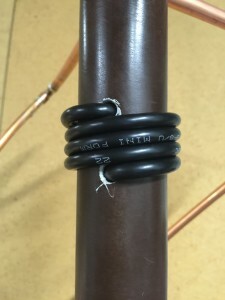 Grasp the top connection with one hand and gently bend the 812mm piece to meet the lower cross bar on the opposite size. You must bend the ENTIRE antenna ANTI-CLOCKWISE when viewed from the top. I repeat, you must bend each leg ANTI-CLOCKWISE. The bend should be as even as possible, and I frankly don’t have any magic way to get this done or confirm it was done correctly other than the old hairy eyeball. Then repeat with the other 812mm piece. If something looks out of place and not even, just do your best to shape it to the best of your ability. Then move on to the short leg with the same procedure. Again, once you are satisfied, it is time to “lock it down” by sweating the tubing and elbows together. If you are still with us, good news, most of the hard stuff is over. The next step is getting the coax in and making the balun. In my case, I took my coax jumper and cut both ends off. Take about four feet and stuff it through the bottom hole you drilled earlier. Then wrap it around so you have four complete turns. Cut the other end so that a foot or so will be left when you stuff it through the upper hole. Then stuff it through the upper hole. 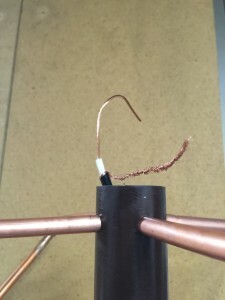 If you do this correctly, the tension in the coax will hold it just fine. 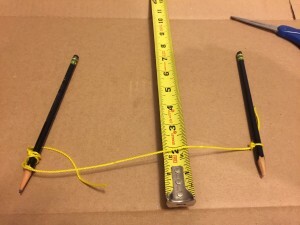 Now we will have to make two jumper wires to connect the two legs of the antenna. Take a piece of wire, I think I used 18ga here, it doesn’t really matter. Cut it as small as you are comfortable working with and crimp or solder ring terminals on the ends. Then strip a bit of the wire in the center. Did I say the tough part was over? I meant almost. I wish I would have taken a picture of this, but I didn’t. 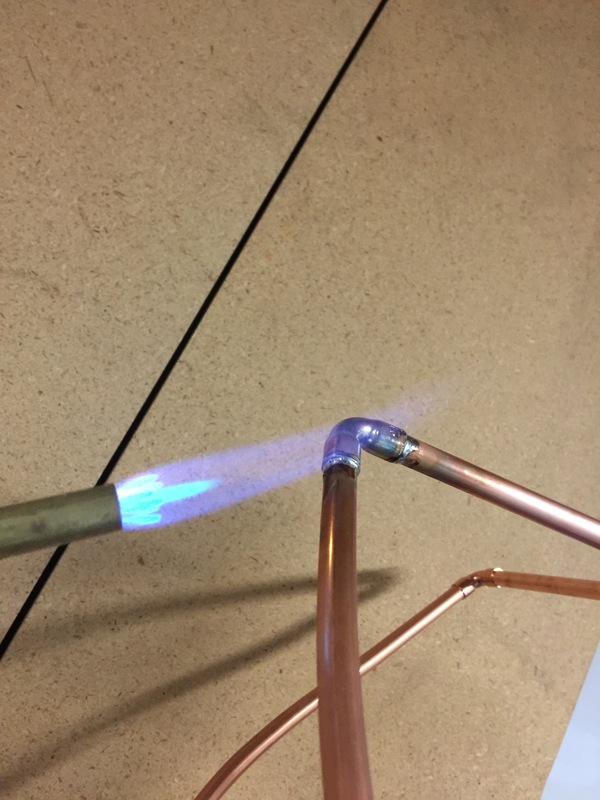 You are going to have to drill a tiny guide hole in each of the four pieces of tubing, inside of the pipe. Then using the small sheet metal screws, you are going to have to screw down the ring terminals to the tubing. I had to bend the terminals up to a 90 degree angle to get them all to fit. You will be connecting one long leg to one short leg for each wire. Again, one long leg to one short leg. 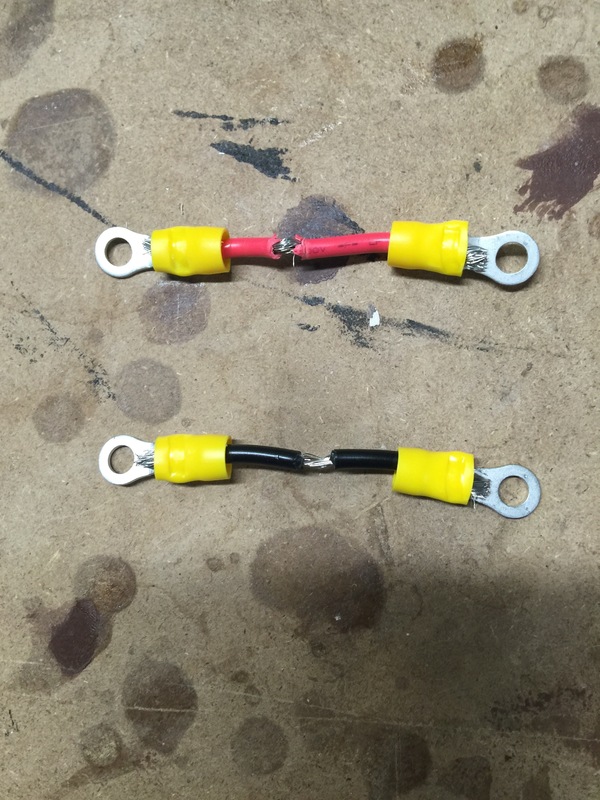 Next, if you are so inclined, use a multimeter to ensure that each leg is electrically separated from the other. Then glue on your top cap. Then proceed to use the outdoor silicone to seal every penetration in the pipe. 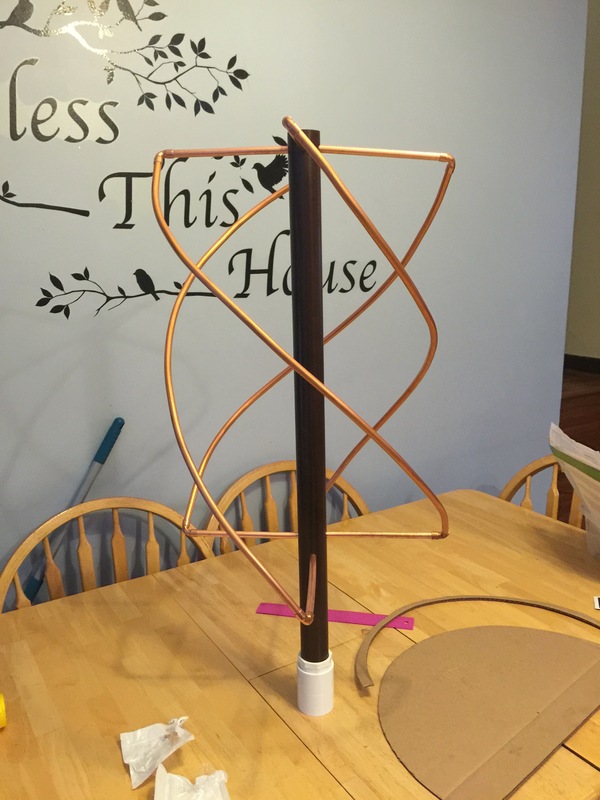 The last step in finishing this antenna is one for which I don’t have a good solution. At this point you will have a piece of coax hanging out the bottom of your antenna. You will need to somehow mount a SO-239 chassis connector at the bottom of the pipe. 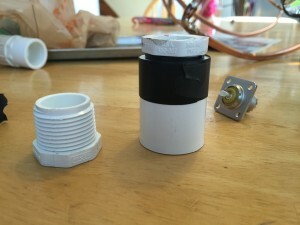 I took a 3/4″ PVC plug, drilled a hole, soldered the coax on to the S0-239, and mounted the SO-239 connector to the plug. The problem is, there is no mechanical way to connect the plug into the bottom of the pipe. I wrapped electrical tape around the plug, then stuffed it into a 1″ coupling. I then took the 1″ coupling, wrapped more tape around it and stuffed it into the bottom of the antenna. 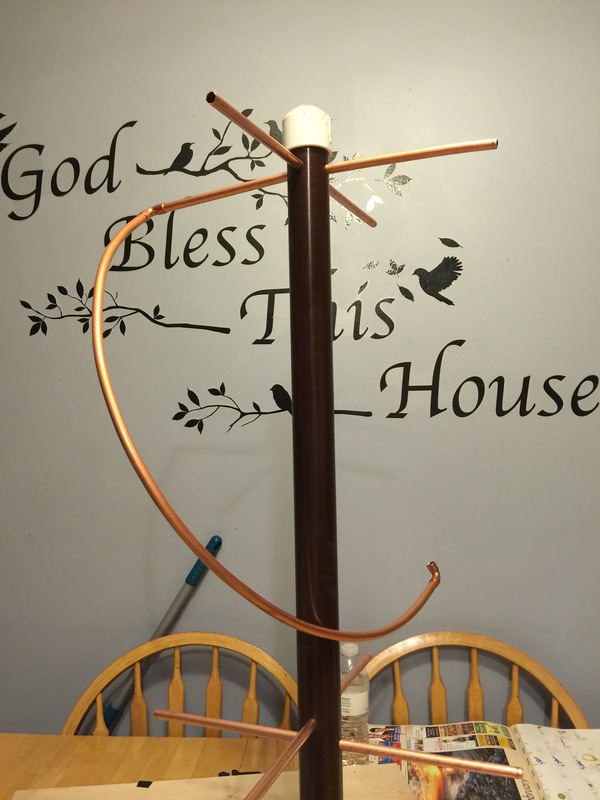 My antenna has been up for over a year now, and this solution worked. It appears as if there are no leaks and it still functions properly. Mounting this antenna is another animal that will be left up to your situation. 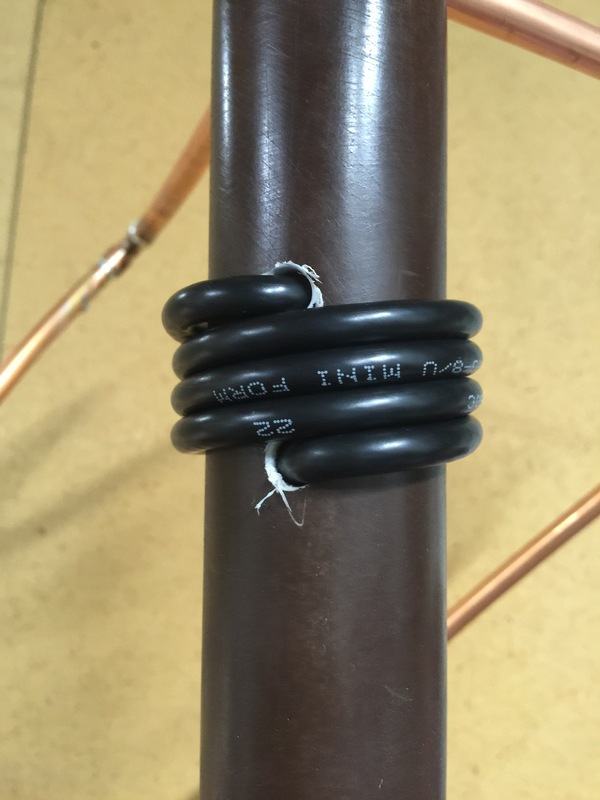 I ended up taking a 1 1/4″ to 1 1/2″ coupling and mounted the antenna on top of a piece of 10ft, 1 1/2″ pipe. This project will take some effort, no doubt, but the end result is something to be proud of..and can help predict weather.